Two of the league’s fastest rising defensive stars are Jets safety Jamal Adams and Bills cornerback TreDavious White, both LSU products. Eagles cornerback Jalen Mills, also from the LSU lineage, was a starter on last season’s Super Bowl championship team. Two defensive backs have made serious runs at the Heisman Trophy in this decade, and one of them is from LSU. Mathieu finished fifth in the 2011 Heisman voting, playing strictly DB. Michigan’s Jabrill Peppers finished fifth in 2016, but he played offense and defense. This season, LSU has one preseason All-American defensive back — sophomore CB Greedy Williams — and another standout in sophomore safety Grant Delpit. 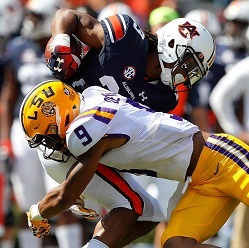 In Saturday’s matchup with 7th-ranked Auburn, Delpit’s interception on the opening drive set up LSU’s first touchdown. The 12th-ranked Tigers went on to upset Auburn on the road, 22-21. Delpit also had a team-high 10 tackles in the game. Delpit has been compared to Adams, the type of versatile defender that coaches love because they can deploy them all over the field. LSU defensive coordinator Dave Aranda has been using Delpit in the “quarter” position, where he often lines up in the box and plays something of a linebacker / nickel corner hybrid. Delpit’s ability to rush the passer is now just as much part of the game plan as his ability to cover pass-catchers. Delpit’s effort on Saturday helped push LSU to a 3-0 record and a No. 6 ranking in the latest Associated Press poll. Auburn dropped to the 9th spot. Shawn Williams, SS, Bengals (NFL) — After getting ejected early in last week’s win over the Colts for a helmet-to-helmet hit on QB Andrew Luck, Williams was allowed to stay on the field and play football long enough to make things difficult for Ravens QB Joe Flacco on Thursday. Williams’ strip-sack on Flacco late in the fourth quarter sealed Cincinnati’s 34-23 victory. He also had an interception in the second half and finished with eight tackles. Deandre Baker, DB, Georgia (NCAA) — The senior preseason All-American had an interception, a forced fumble, and one tackle-for-loss in the 3rd-ranked Bulldogs’ 49-7 rout of Middle Tennessee on Saturday. Marcus Williams, FS, Saints (NFL) — The face of the Browns’ latest heartbreaking loss will be kicker Zane Gonzalez, who missed two field goals and two extra points in Sunday’s 21-18 loss to the Saints. But a key figure in the outcome was Williams, whose fourth-quarter interception set up a go-ahead touchdown for New Orleans. Byron Murphy, CB, Washington (NCAA) — The sophomore recorded five tackles and four pass breakups in the Huskies’ 21-7 win at Utah, and had a monster hit on Utes receiver Britain Covey. Derwin James, FS, Chargers (NFL) — The rookie had a game-high eight tackles to go with one sack and one pass breakup in L.A.’s 31-20 win over the Bills on Sunday. 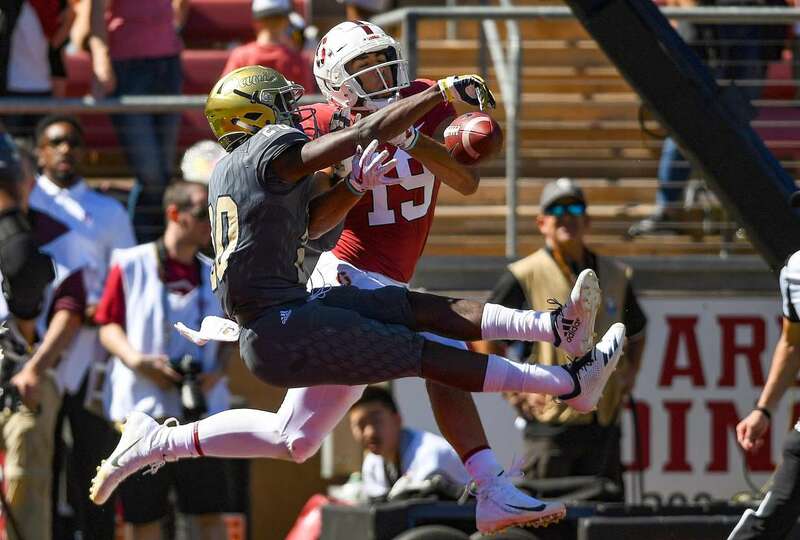 Pic of the Week: UC Davis defensive back Vincent White (gold helmet) breaks up a pass intended for Stanford receiver J.J. Arcega-Whiteside on Saturday. Stanford won 30-10.